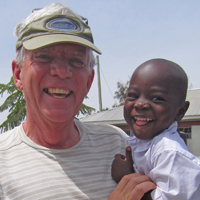 A recent article that I wrote for the Kingston Whig Standard about little Jerry O, a 4 year old Kenyan orphan that I encountered earlier in 2012, brought several responses that included questions about adoption. Here is a response that I sent to one couple who inquired about adopting this child. “There are many, many children in Africa who are vulnerable in so many ways. Your offer to help is kind and generous. By “adopt” I am not sure if you are meaning a true adoption – bringing a child to Canada – or a distance adoption which amounts to sponsorship and support from here. The true adoption process is long and complex and I really know very little about it. African countries tend to be pretty strict on the process of adoption to another country, requiring that the adoptive parents actually live in the African country for a period of time prior to any adoption happening. Private adoption would also likely entail similar restrictions. But I am not familiar with all the laws and rules. You may have explored them already. Individuals who support a child through organizations like World Vision can be sure that money that they donate is being used in the community where the child lives. Your “adopted” child benefits through the supprt that is given to the community for sanitation, education and health. At the CanAssist African Relief Trust, we realize that it is impossible to help any one child specifically without overlooking someone else who may be as deserving. Our preference has been to provide help within a community or school that will, in some way, benefit all. CanAssist does not facilitate individual supportive programs for school fees, etc, but rather works to help within the community, using community leaders, teachers and health care workers to guide our work there. I commend your interest in helping these vulnerable children. There are, no doubt, families in Canada who would gladly “adopt” a struggling orphan child from a developing country. But it is not simple. Not only is the adoption process encumbered with discouraging red-tape, but rescuing one child leaves many others behind who are equally needy and deserving of support. This entry was posted in Uncategorized and tagged Africa, aid, assistance, CanAssist, canassistafrica, children, Development, dilemma, John A Geddes, johnageddes by johnageddes. Bookmark the permalink.